An Amidah is the core of every Jewish worship service, and is therefore also referred to as “The prayer.” Amidah, which literally means, “standing,” refers to a series of blessings recited while standing. The Amidah is also considered a person's opportunity to approach God in private prayer. Rabbi Jack Riemer wrote an Alternate Amidah for Rosh Hashanah and I have slightly adapted it to reflect on as we consider a vision for a better self. You are invited to express a vision of your better self in words or images on the paper after the questions posed in the Amidah. This paper is for you alone; this reflective writing is just for you. Let us ask ourselves hard questions for this is the time for truth. Were we a help to our mates, family, or friends, or did we take them for granted? How was it with our friends: Were we there when they needed us? Did we respect the rights and feelings of those who worked with us, went to church with us, lived near us? Did we acquire insights or just possessions? Did we speak out when something hurtful or negative was said? Or did we fear what the crowd would say and keep quiet? Did we live according to our values, ethics, morals, and, if not, then have we learned, and will we change? Now take some time to express a vision of your better self. Reverend John Dietrich, the founder of Unitarian Religious Humanism wrote: “[Religion is] the up-reaching and aspiring impulse in a human life. It is life striving for its completest fulfillment, and anything which contributes to this fulfillment is religious, whether it is associated with a god, or not.” Our Unitarian Universalist Sources (https://www.uua.org/beliefs/what-we-believe/sources), from which we draw for our spiritual sustenance and grounding aid us in this striving for “completest fulfillment”. They remind us of our religious heritage, call us to consider time-honored wisdom, and invite us to draw on these Sources as we look deeply within ourselves. Two Sources from which we draw include: Humanist teachings which counsel us to heed the guidance of reason and the results of science, and warn us against idolatries of the mind and spirit; and Jewish and Christian teachings which call us to respond to God's love by loving our neighbors as ourselves. Some people might experience these two Sources as being diametrically opposed, as being mutually exclusive, that it’s nonsense to put them in the same sentence. But, I think of them as a call for dynamic balance. We need both the spiritual and the scientific in exploring our faith, beliefs, ethics and morals. Leaning too much in the direction of the spiritual can lead to idolatries of the mind and spirit, leaning too much in the direction of science can lead to a lack of empathy and compassion. As Unitarian Universalists we seek balance in our beliefs, ethics, morals, and expression of our faith. And as Unitarian Universalists, we understand that balance is not the same thing as static; it’s an active state of being. A number of years ago this congregation decided to be intentionally pluralistic, thus embracing our Unitarian Universalist Sources, all our sources; considering what we all might learn from the various religious, spiritual, and ethical traditions that exist in our world. As a result of that decision a number of affinity groups have formed over the years. One of those is our DuPage Unitarian Universalist Church Jewish Heritage Group. I have felt privileged to join the Jewish Heritage Group at celebrations of Hanukkah and Passover. What I noticed right away was that while the members of this group treasure the myths and traditions of their Jewish faith, they do so from a more humanistic perspective—in other words god is not the focus of their beliefs, they instead consider the meanings this religious tradition offers them in the here and now. In other words they practice a Jewish theology that finds expression on the moral plane, between individuals. I hope I am not misrepresenting the group when I say that they believe Judaism is not the result of divine intervention, but was molded by the experience of the Jewish people. That the holy days are human responses to events and celebrations of human development. And the music and literature are inspired by human experience. I know for a fact it is accurate to say this church honoring Yom Kippur and Rosh Hashanah in a Sunday service is important to the Jewish Heritage group. Remembering Yom Kippur and Rosh Hashanah in our Sunday morning service can also remind Unitarian Universalists of our Judeo Christian roots and gives us an opportunity to consider what we might learn from these time-honored traditions. We are not here to usurp Judaism or to in any way claim their practices as our own, but to reflect on some of the wisdom and practices of Judaism and consider what we, as Unitarian Universalists, might learn from them. I have often felt that one thing that we lack in Unitarian Universalism is a tradition or ritual that calls us to intentionally reflect on where we have “missed the mark” and how to move forward after “missing the mark”. The Hebrew word for sin is “chet”, which literally means “missing the mark.” According to Jewish beliefs, a person sins when he/she/they strays away from making good, correct choices. For a Unitarian Universalist the term sin may be problematic, but the concept of “missing the mark” by not making choices that are consistent with our values, ethics, morals, and/or beliefs is a concept that we’re all personally familiar with—unless you’re one of the lucky people who never does anything wrong. We have all made choices that we regret because they are not consistent with our values, ethics, morals, and/or beliefs, that is the human condition; we are not perfect. The question is what do we do once we have missed the mark. Do we reflect on what we did? Do we consider how to forgive or make amends? Do we learn from this behavior? Do we make changes in our lives due to this experience? And how can we consistently hold our values, ethics, morals, and/or beliefs in the front of our mind so that we reduce the frequency of missing the mark? The beginning of the Jewish year is also more or less the beginning of our Unitarian Universalist church year. I wonder if we UUs might find a way to incorporate an intentional time of reflection and renewal into the beginning our church year or if not then, perhaps another time of the year. Not to appropriate the Jewish tradition, but to find a way to honor the importance of learning from our times of missing the mark. And a time to envision being our better selves. 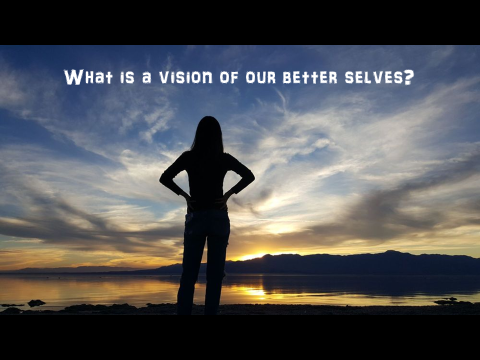 During the time of reflection I led you through earlier, I invited you to write a vision of your better selves. Notice I didn’t say “best” self. It’s not about perfection. It’s about improvement. What, if anything, about your better self is different from who you are, how you are, today? Consider where you might put that paper if you want to hold onto that vision. Consider if there is more to learn as you go deeper into that vision—where it might take you on your journey. If we’re going to have an honest relationship with ourselves then we must make time to stop and let that vision waiting within to awaken us. We also need to stop and reflect on who we are and how we are in our relationships with other people. Hopefully, you find opportunities to do both of these here in this church. And here we can practice being our better selves; here we can ask ourselves difficult questions; here we can share parts of ourselves that are not always accepted outside these walls. Here we can be affirmed for who we truly are and for being better. And when we miss the mark—and that does happen—here we can practice forgiveness, reconciliation, and peacemaking. While we find wisdom in the religious and spiritual traditions of the world and from many prophetic people and from science and reason, we are not here to emulate Jesus or Buddha or Mouhamed or Confucius or Lao Tzu or anyone; we are here to encourage each of us to be the most authentic person you can be. Being your most authentic self takes work and practice and we will be there to support and encourage you in this work, and rejoice in what you accomplish. We are all capable of being our better selves. This church is a place “where we encounter each other with wonder, appreciation, and expectation, where we call out of each other strengths, wisdom, and compassion that we never knew we had.” (Beverly and David Bumbaugh, UU ministers) And may it always be so.